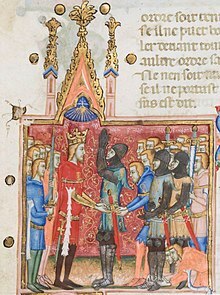 Investiture of a knight (miniature from the statutes of the Order of the Knot, founded in 1352 by Louis I of Naples). In a classic definition by François-Louis Ganshof (1944), feudalism describes a set of reciprocal legal and military obligations among the warrior nobility, revolving around the three key concepts of lords, vassals and fiefs, though Ganshof himself noted that his treatment related only to the "narrow, technical, legal sense of the word". Outside a European context, the concept of feudalism is often used only by analogy (called semi-feudal), most often in discussions of feudal Japan under the shōguns, and sometimes medieval and Gondarine Ethiopia. However, some have taken the feudalism analogy further, seeing feudalism (or traces of it) in places as diverse as Spring and Autumn period in China, ancient Egypt, the Parthian empire, the Indian subcontinent and the Antebellum and Jim Crow American South. 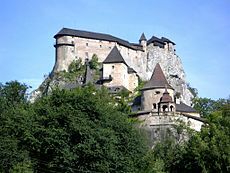 Feudalism, in its various forms, usually emerged as a result of the decentralization of an empire: especially in the Carolingian Empire, which lacked the bureaucratic infrastructure[clarification needed] necessary to support cavalry without the ability to allocate land to these mounted troops. Mounted soldiers began to secure a system of hereditary rule over their allocated land and their power over the territory came to encompass the social, political, judicial, and economic spheres. 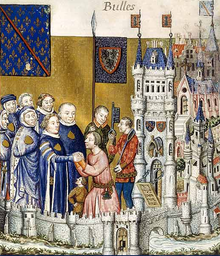 The classic François-Louis Ganshof version of feudalism describes a set of reciprocal legal and military obligations among the warrior nobility, revolving around the three key concepts of lords, vassals and fiefs. A lord was in broad terms a noble who held land, a vassal was a person who was granted possession of the land by the lord, and the land was known as a fief. In exchange for the use of the fief and protection by the lord, the vassal would provide some sort of service to the lord. There were many varieties of feudal land tenure, consisting of military and non-military service. The obligations and corresponding rights between lord and vassal concerning the fief form the basis of the feudal relationship. Feudalism effectively ended by about 1500. This was partly since the military shifted from armies consisting of the nobility to professional fighters thus reducing the nobility's claim on power, but also because the Black Death reduced the nobility's hold over the lower classes. 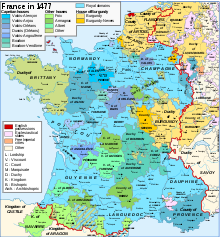 Vestiges of the Feudal system hung on in France until the French Revolution, and the system lingered on in parts of Central and Eastern Europe as late as the 1850s. Russia finally abolished serfdom in 1861. The concept of a feudal state or period, in the sense of either a regime or a period dominated by lords who possess financial or social power and prestige, became widely held in the middle of the 18th century, as a result of works such as Montesquieu's De L'Esprit des Lois (1748; published in English as The Spirit of the Laws), and Henri de Boulainvilliers’s Histoire des anciens Parlements de France (1737; published in English as An Historical Account of the Ancient Parliaments of France or States-General of the Kingdom, 1739). In the 18th century, writers of the Enlightenment wrote about feudalism to denigrate the antiquated system of the Ancien Régime, or French monarchy. This was the Age of Enlightenment when writers valued reason and the Middle Ages were viewed as the "Dark Ages". Enlightenment authors generally mocked and ridiculed anything from the "Dark Ages" including feudalism, projecting its negative characteristics on the current French monarchy as a means of political gain. For them "feudalism" meant seigneurial privileges and prerogatives. When the French Constituent Assembly abolished the "feudal regime" in August 1789 this is what was meant. He also took it as a paradigm for understanding the power-relationships between capitalists and wage-labourers in his own time: ‘in pre-capitalist systems it was obvious that most people did not control their own destiny—under feudalism, for instance, serfs had to work for their lords. Capitalism seems different because people are in theory free to work for themselves or for others as they choose. Yet most workers have as little control over their lives as feudal serfs’. Some later Marxist theorists (e.g. Eric Wolf) have applied this label to include non-European societies, grouping feudalism together with Imperial Chinese and pre-Columbian Incan societies as 'tributary'. In the 20th century, two outstanding historians offered still more widely differing perspectives. 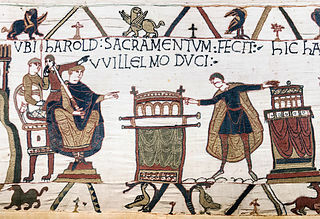 The French historian Marc Bloch, arguably the most influential 20th-century medieval historian, approached feudalism not so much from a legal and military point of view but from a sociological one, presenting in Feudal Society (1939; English 1961) a feudal order not limited solely to the nobility. 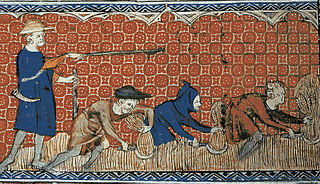 It is his radical notion that peasants were part of the feudal relationship that sets Bloch apart from his peers: while the vassal performed military service in exchange for the fief, the peasant performed physical labour in return for protection – both are a form of feudal relationship. According to Bloch, other elements of society can be seen in feudal terms; all the aspects of life were centered on "lordship", and so we can speak usefully of a feudal church structure, a feudal courtly (and anti-courtly) literature, and a feudal economy. ^ Noble, Thomas (2002). The Foundations of Western Civilization. Chantilly, VA: The Teaching Company. ISBN 978-1565856370. ^ a b c d e f François Louis Ganshof (1944). Qu'est-ce que la féodalité. Translated into English by Philip Grierson as Feudalism, with a foreword by F. M. Stenton, 1st ed. : New York and London, 1952; 2nd ed: 1961; 3rd ed. : 1976. ^ a b c d e f "Feudalism", by Elizabeth A. R. Brown. Encyclopædia Britannica Online. ^ a b c "Feudalism? ", by Paul Halsall. Internet Medieval Sourcebook. ^ a b "The Problem of Feudalism: An Historiographical Essay", by Robert Harbison, 1996, Western Kentucky University. ^ Charles West, Reframing the Feudal Revolution: Political and Social Transformation Between Marne and Moselle, c. 800–c. 1100 (Cambridge: Cambridge University Press, 2013). ^ Cantor, Norman F. (1994). The Civilization of the Middle Ages. ^ a b c d e f g h i Meir Lubetski (ed.). Boundaries of the ancient Near Eastern world: a tribute to Cyrus H. Gordon. "Notices on Pe'ah, Fay' and Feudum" by Alauddin Samarrai. Pg. 248–250, Continuum International Publishing Group, 1998. ^ Archibald R. Lewis. The Development of Southern French and Catalan Society 718–1050, 1965, pp. 76–77. ^ Medieval Feudalism Archived 2012-02-09 at the Wayback Machine, by Carl Stephenson. Cornell University Press, 1942. Classic introduction to Feudalism. ^ Lefebvre, Georges (1962). The French Revolution: Vol. 1, from Its Origins To 1793. Columbia U.P. p. 130. ISBN 9780231085984. The Haute Cour was the feudal council of the Kingdom of Jerusalem. It was sometimes also called the curia generalis, the curia regis, or, rarely, the parlement. Indian feudalism refers to the feudal society that made up India's social structure until independence in 1947. Technology, Tradition and the State in Africa is a book studying the indigenous political systems of sub-Saharan Africa written by the British social anthropologist Jack Goody (1919–2015), then a professor at St. John's College, Cambridge University. It was first published in 1971 by Oxford University Press for the International African Institute.